Stories of the Zombie Apocalypse are more than just entertainment. Zombies embody our fears of illness and death, and the stories that revolve around them force us to confront those fears–working almost as a coping mechanism. The following excerpt from Living with the Living Dead analyzes the symbolism behind apocalyptic film and television. In the accompanying video, author Greg Garrett answers the question: why have cultures and societies, over the ages, used images of death and the walking dead to create meaning of their times? Like war stories, like disaster films, like any kind of narrative that revolts and scares yet also delights us, the Zombie Apocalypse offers a laboratory for observing human emotion and experience. Its excess opens up a multitude of responses that don’t get explored in the course of our everyday lives, although these same choices lurk underneath the surface of all our lives. It would seem, then, that in its headline for a recent discussion of The Walking Dead, the Atlantic has it right: “‘The Walking Dead,’ Like All Zombie Stories: … Not about Zombies at All.” The story of the Zombie Apocalypse instead is a way that we ask questions about what it means to be human. Along with a healthy dose of fear and excitement, we get our daily requirement of ethical and philosophical reflection, all in the guise of stories about the living dead. Zombies are popular villains because they have affinities to us yet seem alien. As Kim Paffenroth points out in his study of the films of George Romero, zombies are creatures poised between two states, straddling the line between human and nonhuman and the boundary between living and dead, and there is something familiarly monstrous about this. Zombies are, in fact, scientifically demonstrated to be among the most frightening menaces we could watch, read about, or fight. Masahiro Mori, the robotics researcher, discovered in his research in the 1970s that humans feel increasingly comfortable with robots as they become more human in appearance, until they become too humanoid, at which point the identification becomes a painful one. While Mori says in a recent interview that science seems to be able to quantify this effect, it is an emotional proof as well as a physiological one; we know it because we feel it, not just because our brain waves change when exposed to such creatures: “the brain waves act that way because we feel eerie. It still doesn’t explain why we feel eerie to begin with. The uncanny valley relates to various disciplines, including philosophy, psychology, and design, and that is why I think it has generated so much interest.” Echoing Mori’s word “eerie,” Travis Langley notes of this research that creatures that are “eerily human while obviously nonhuman” seem to push all our buttons, and we can see this by noting how zombies reside in what Mori called bukimi no tani (the uncanny valley). The opening credits of the film “World War Z” offer a montage of contemporary problems: overpopulation and overcrowding, traffic jams, epidemics, toxic waste, all intercut with scenes of nature becoming ever more menacing, ending with swarms and feeding frenzies. It visually depicts a jarring and genuinely frightening idea: that nature operates by certain rules, and that we are pushing up against the very boundaries of those rules. In addition to (or perhaps because of) being supremely frightening in their depiction of almost-human monsters, zombies act as symbols for all sorts of free-floating twenty-first-century anxieties, from the spread of Ebola and Zika to the breakdown of the financial markets to changes in gender roles to the menace of global terrorism. While this conclusion may perhaps be startling if you are not a consumer of all things zombie, it is nothing new. As Paffenroth noted in 2005, critics and fans have long known that zombie films can be “serious and thoughtful examinations of ideas,” and his book points out Romero’s powerful social criticism of American racism, consumerism, and individualism through the medium of zombie stories. That serious and thoughtful consideration continues today. If you are an American or European troubled by the flood of Syrian refugees, their slow steady advance might bear some of the menace of the inexorable approach of the undead. If you are a white male in the United States or United Kingdom, the steady loss of power and control and the rapidity of change you experience might feel like the relentless bad news of the Zombie Apocalypse. Whether you are concerned about the seemingly unstoppable spread of religious extremism, or by the growing incivility in public life, or by the relentless breakdown of our infrastructure, or by the science of global warming, all of these menaces bear a relationship to the inexorable advance of the Zombie Apocalypse. Even for those of us who toil every day at jobs that never seem to be finished, or that will have to be done and redone for a seeming eternity, the never-ending stream of zombies bears a correspondence to real life. What is the unfinished business in your life? What is the task that keeps coming, no matter what? For me, the Zombie Apocalypse is doing dishes: at my house, a never-ending stream of dirty dishes have to be rinsed, placed in the dishwasher, removed from the dishwasher, and placed in cabinets, and just when I think they are done, down, they get back up and the whole exercise has to be performed all over again. Every day offers a new battle; every day is the same old thing, and it exhausts me. Thus do zombies come to stand in not only for exotic and world-threatening menaces, but for mundane exertion, the attack of everyday life that paradoxically can be best told by stories about the walking dead. Featured image credit: “tombstone-old-grave-stones-cemetery” by bernswaelz. CC0 via Pixabay. Greg Garrett is Professor of English at Baylor University, where he teaches classes in fiction and screenwriting, literature, film and popular culture, and theology. The author or co-author of three dozen short stories, a dozen scholarly articles, and twenty books of fiction, nonfiction, and memoir, Dr. Garrett is also Theologian in Residence at the American Cathedral in Paris and a licensed lay preacher in the Episcopal Church. 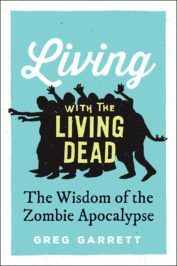 Most recently, he is the author of Living with the Living Dead: The Wisdom of the Zombie Apocalypse. I found Dr Garrett’s comments very timely. I recently found myself wondering why the zombie had returned (as it were) to become the primary horror figure, and, of course, crossing into action films, when it was a relatively moribund or marginal genre for several decades. It struck me that there was a new ideological function being performed, which is the basis of a piece of art I’m making, wherein the zombie represents not so much the alien ‘other’, but the corrupted ‘same’. The legitimation and necessity of killing one’s tainted fellows provides an ideological basis for the radical rejection of the apostate American.